You can give credit to a bunch of different factors: the rise of speciality coffee chains, exposure to different coffee cultures in our travels, and crossover as different types of foodservice operations look to gain market share in the world of coffee — to name a few. But no matter where or how the trend started, there’s no denying espresso drinks play an enormous role in our collective beverage experience. And they can be quite profitable. As you can see, even from these brief statistics, espresso-based coffee consumption is a growing trend, and a great deal of that consumption takes place outside the home in some sort of foodservice establishment. This means operators should be aware of the different types of espresso-based drinks. SINGLE SHOT: The most basic espresso beverage, just 30 ml of pure espresso. DOUBLE SHOT: Twice as much as a single shot, also called a doppio. AMERICANO: A shot of espresso with double the amount of hot water, make it a double shot for a more intense version. LATTE: A double shot of espresso, a good portion of steamed milk, and topped with a small amount of foam. MACCHIATO: A traditional macchiato is a shot of espresso with a dollop of foamed milk on top. MOCHA: A double shot of espresso, the same amount of chocolate, and half the helping of steamed milk. RISTRETTO: For coffee drinkers that are short on time or want a packed punch, it is a highly concentrated, smaller shot of espresso. 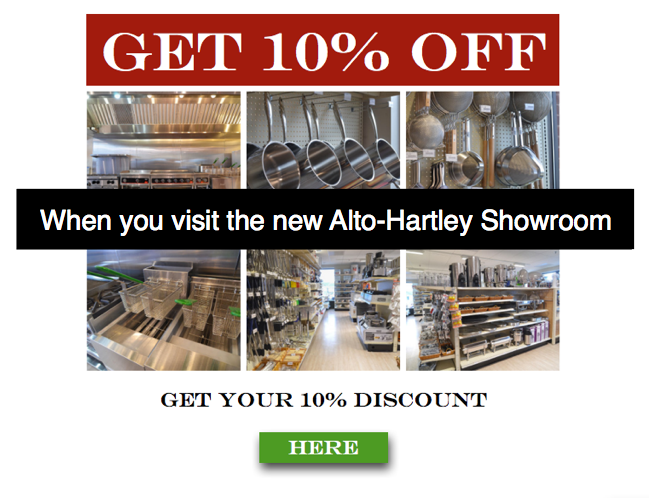 Stop by the Alto-Hartley showroom to learn more about super-automatic coffee. Come try a cup for yourself, and be sure to bring the 10% off coupon below to get a discount on your espresso machine purchase.